One of the longest trail systems on Vancouver Island, the Galloping Goose and Peninsula Trails stretch from the old mining town of Leechtown to Swartz Bay. Named after an historic gas rail car that once ran between Victoria and Sooke in the 1920s, the Galloping Goose Trail makes up the first 60 km (38 miles) of the 100 km (63 mile) trail system. It is famous for both its scenic vistas and accessibility to major urban areas and links more than 7 regional, civic and provincial parks throughout the southwest section of the island. The Galloping Goose can be entered from 27 access points. Parking is provided at specific locations and is easily accessible from main roads. A good place to begin the trail by foot or bicycle, is Roche Cove Regional Park, approximately 11 km/7 miles southeast of Sooke Potholes Provincial Park. Parking and washroom facilities can be found at Gillespie Road. Or you can pick up the trail from Rocky Point Road, approximately 10 km/ 6 miles southeast. There are parking facilities at this entrance but no washrooms. Trails within Roche Cove Regional Park offer horseback riding, hiking and secluded walks. The 117 hectare park shares its east boundary with Matheson Lake Provincial Park. Bike riding is prohibited on the Matheson Lake trails, which includes some steep embankments and heavily forested areas. It is a good area for nature viewing and although it does not have a boat ramp, kayaks and other smaller boats can be used on the lake. Heading southwest from these points takes you towards Sooke Potholes Provincial Park, another day park that offers swimming and fishing. The trail follows the Sooke River over a couple of trestles that provide easy transit for bikers in heavily forested areas. The trail eventually ends at Leechtown, an abandoned mining town about 9 km/5.5 miles from Sooke Potholes Provincial Park. Roughly 9 km/5 miles north of the parking facilities at Roche Cove Regional Park, is Devonian Regional Park. Gentle walking trails take you through wooded terrain, along side a creek and Sherwood Pond. Devonian Regional Park overlooks the Strait of Juan de Fuca and provides a serene location for picnics or studying marine wildlife. 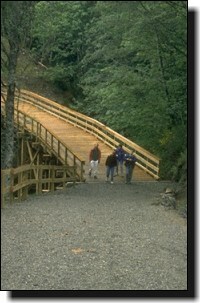 The Devonian walking trails are considered accessible for individuals who are not able to hike steeper terrains, although the trails are not wheelchair accessible. A 3 km/1 mile jaunt south from the Galloping Goose trail at Happy Valley Road takes you to Witty's Lagoon. The regional park is known both for impressive archeological sites and for its pristine marine environment. Once the home of the Northern Straits Salish people, Witty's Lagoon has 5 known archeological sites. It is also an excellent area in which to study wintering wildfowl, local marine life or the subtle flowers of spring and summer foliage. From this point on, access to the Galloping Goose and Peninsula trails becomes easier. There are access points (some with parking facilities) approximately every 2-8 km/1-5 miles along the route. (Click here for a map of the trail). 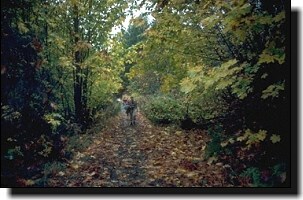 Most of the Galloping Goose trail is gravel or dirt surface, with moderate to easy terrain. As the trail approaches the Esquimalt and Victoria areas, you will encounter some paved sections and will find that the bicycle and foot traffic increases. There is an arm of the trail that juts south through the residential community of Esquimalt and is referred to as the "Downtown Connector". The Selkirk Trestle provides scenic vistas for casual strolling along the waterway. The connector is commonly used by bicycling commuters travelling to downtown Victoria. North of Victoria, the Peninsula Trail travels through Saanich, along Cordova Bay and through Lochside Park. Take note that the trail detours twice in this area, requiring travellers to cross over roads in order to continue on the trail. The first location is at Blenkinsop Lake, approximately 4 km/2.5 miles north of the downtown connector. Follow the signs along Blenkinsop Road to the trail on the other side of the lake. The other detour occurs at Island View and Pat Bay Highway, approximately 10 km/6 miles further. Turn left at the access point at Island View and continue until you reach Pat Bay Highway, then follow it north to Mt. Newton Cross, where the trail resumes. There are some great places to investigate along this stretch of the trail, including Mattick's Farm and the Saanich Historical Artifacts Society. Elk/Beaver Lake Regional Park lies on the opposite side of the Peninsula Trail from Mattick's Farm, and is accessible from Pat Bay Highway. The park marks the home of another historic railway system, the "Cordwood Limited", which stretched between Victoria and the small community of Sidney. Even after the railway closed in 1919, the park remained a favourite location for outings. Known as the "Freshwater Playground of Victoria" in the 1930s, it once had a tea room, outdoor dance hall and a chocolate factory to entertain local visitors. It is now a protected regional park. The last 14 km/9 miles of the Peninsula Trail is paved, and runs through the communities of Central Saanich and North Saanich. The trail passes the Anacortes ferry terminal, and the town of Sidney to its conclusion at Swartz Bay, the main terminal for Vancouver-bound ferries. Hugging the northeast coast of Vancouver Island, it offers a picturesque view of the Strait of Juan de Fuca. McDonald Provincial Park lies near the end of the trail and is equipped with 50 campsites (6 are walk in). The park offers boating, fishing, swimming and a birds-eye view of the surrounding islands beyond. "Inside out British Columbia: A Best Places Guide to the Outdoors" by Jack Christie. Published jointly by Sasquatch Books and Raincoast Books, 1998.